This is to certify that the Mr/Ms 姓名 is 職位 in our company. He/She has been working here since 年月日. He/She is allowed to be off work between 去的日期 and 回國日期 to have a 旅游寫trip商務請寫business trip to 所申請的國家，total 天數days . 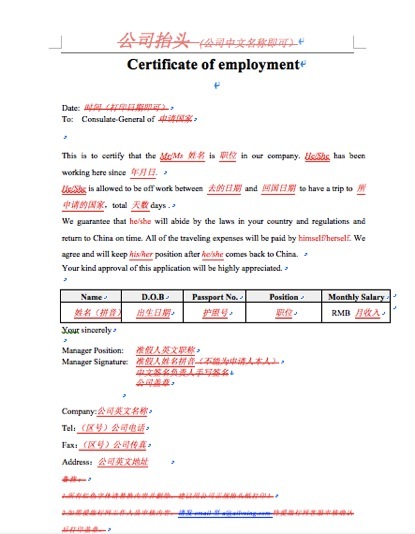 We guarantee that he/she will abide by the laws in your country and regulations and return to China on time. All of the traveling expenses will be paid by 旅游簽證一般為自付費用himself/herself商務簽證通常為公司付款請寫 my company. We agree and will keep his/her position after he/she comes back to China.